ICA is a non-profit, charitable organization in California. 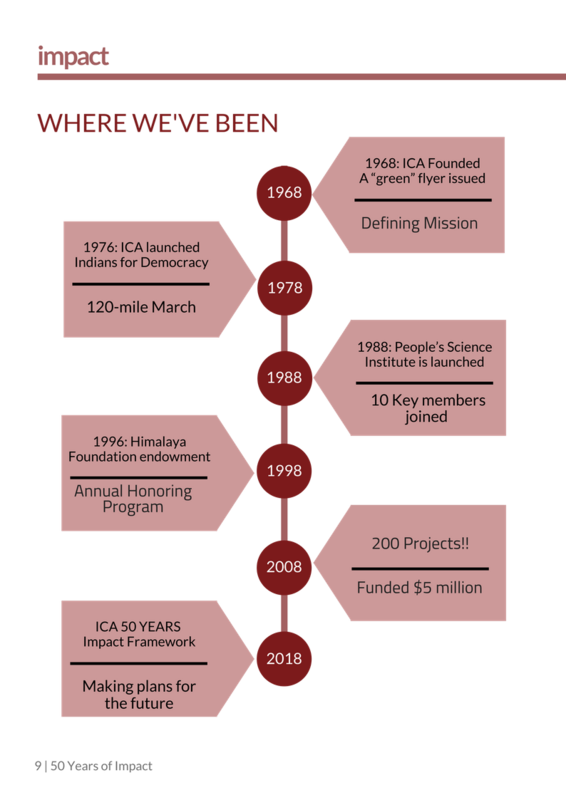 With FREA’S merger with ICA, the work of other FREA chapters in the U.S. (e.g. New York, Philadelphia, and Ithaca) was coordinated by an executive committee at Berkeley. FREA – Bombay continued to function under the same name, with A.K. Dunu Roy as the secretary. To understand the social and economic problems facing India. To make constructive efforts to alleviate the problems through financial assistance and other means. To cooperate with and to assist persons/groups with similar objectives in fields of agriculture, education, health care, and social work. To assist financially and otherwise in the event of natural calamities, and national emergencies in India. 1976 ICA launched IFD (Indians for Democracy) to channel the NRI opposition to GOI’s imposition of State of Emergency in India, under which most national leaders were arrested and the press was heavily censored. IFD led a 120-mile march (Walk for human rights in India) from the Liberty Bell in Philadelphia to the U.N. Plaza in New York, and started a monthly newsletter, Indian Opinion to published uncensored reports from India. As morale booster to the “underground movement” for restoration of basic human liberties in India, this gesture was greatly appreciated. ICA receives a new life after going through a short dormant period, 1981-1984. Abhay, Raj, Isha, Hanumant and Lata arrived in the South Bay area and joined the exec com with Kishan, Santosh, Suresh, PK, and later Geetha and Raju providing support from the East Bay. PSI (People’s Science Institute) is launched in DehraDoon by Ravi Chopra with active support from Dunu Roy and Prof. GD. PSI is a public interest R&D organization that has become nationally and internationally recognized for professional work in environmental quality monitoring, watershed develop, and earthquake-resistant dwellings. In 1995, under PSI’s guidance, 125 of the poorest villages in Palamu Dist. Of Bihar, built 176 earth dams that irrigate 4000 acres of land. In Himachal and UttarKhand States, PSI teams have been instrumental in recharging numerous dried up springs in villages that suffered from shortage of drinking water. In India, PSI is emerging as a leading NGO for building communities that are sustainable economically, socially, and environmentally. HF (Himalaya Foundation) endowment is established by PK as a charitable trust for training leaders for meeting sustainable development needs of communities in the central and western Himalayn States of India, under the guidance of a Board of Trustees, chaired by Ravi Chopra. As an organization that is not intended to imitate but to complement the work of PSI, HF recognizes the need for financial support and mentorship to educated young men and women, who wish to commit themselves to the task of bridging the huge gap that separates the affluent class from a vast number of the poor in India. ICA establishes the tradition of inviting social activists from India at Annual Meetings. SR and Shaymla Hiremath, etc.